Inder Loves Folk Art: White Beans with Tomato. I pressure-cooked the beans in half broth, half water, with a sprig of sage. I'm a huge fan of the pressure cooker. Perfectly tender but never mushy beans in less than an hour, with no soaking or even stirring? For that, I'll take my chances with a major kitchen explosion. No, seriously, technology has come a long way, and you know, follow directions and exercise common sense and stuff. 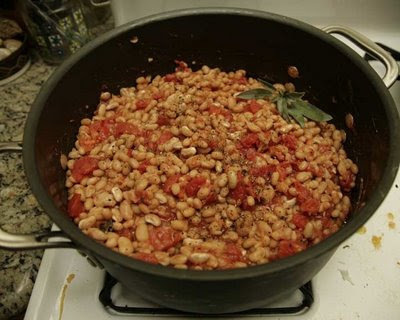 Three cups of white beans takes about 45 minutes at full pressure. I don't usually rinse my beans after cooking, but I did here, to prevent them from becoming too starchy to mix well with the tomato. Since I was using fresh tomatoes, I blanched them by dropping them in boiling water for a minute, then removed them, let them cool, and removed the skins. Chop them up and supplement with chopped canned tomatoes. Keep the tomato juice from the can. In a separate pot, saute garlic and the rest of the sage, minced, together in olive oil, then add the tomato and let it bubble for a little bit. Add the beans and stir. Add tomato juice as needed to keep things loose. Here's where rinsing the beans in cold water and allowing them to cool a bit really pays off - they'll maintain their shape nicely. Add lots of salt and pepper (although you may not need as much salt if you used a salted broth for the beans). Garnish with sage leaf if you're planning to take a picture for the blog. With a little bit of grated Parmesan on top it's no longer vegan, but uh, yum. Thanks to Crouton as always for clean-up.